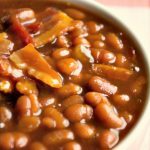 This recipe was sent to us by Crock-Pot Ladies reader Pam Barnes for her grandma’s famous baked beans done up in the slow cooker. We just love “grandma recipes” they are always the best aren’t they? Then this recipe is for you because it comes from a grandma that CAN cook! Thanks Pam and her grandma for the great recipe! This recipe serves a crowd too…12 servings. So this is a great dish to take to your next pot-luck or serve at a outdoor barbecue. 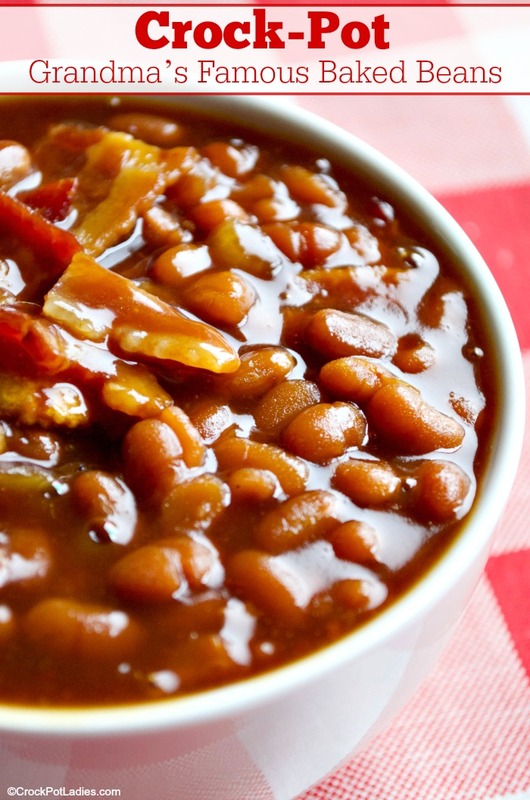 Everyone loves some baked beans at a BBQ right? There is a wee bit of prep work involved with these beans…but not too much. Just cutting up some onion and frying up some bacon. You had me at bacon Pam’s grandma! Then you just open up some cans of baked beans and toss those in (Pam prefers Bush’s Baked Beans, but feel free to use whatever brand YOU like). And then, just let it simmer away for 4 hours and let it rest for 1 hour, to thicken up those beautiful bean juices. But oh well…that is what they are! Dice raw bacon into small pieces and cook in a medium skillet over medium-high heat on the stove-top until crispy. Using a slotted spoon remove cooked bacon from pan and allow to drain on a plate lined with paper towels. Drain all but 1 tablespoon of the bacon grease off from the pan and place pan bacon on stove and add the diced onion and cook until the onion just starts to turn golden in color. 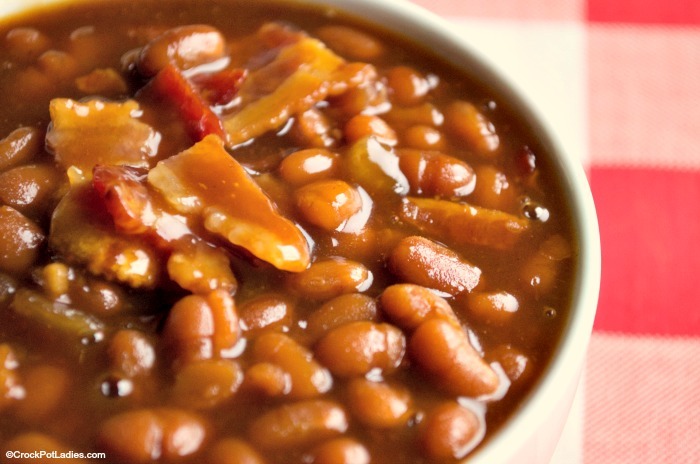 Add the canned beans, cooked bacon, onion, brown sugar and BBQ sauce all to a 5 to 6 quart or larger slow cooker. Cover and cook on HIGH for 4 hours. Turn slow cooker off and allow the beans to set for at least 1 hour to allow the sauce to thicken. This recipe was first published in October 2011. And we have decided it was time for an update. New photos, as well as special diet and nutritional information has been added. We hope you enjoy!